Once, when I played Strat-o-Matic and thought the back of baseball card was an encyclopedia, projections drove me crazy. Once, I looked at season predictions as if the analyst was looking at his own crystal ball, that he was somehow so special that he could see into the future. I knew nothing, and so I figured that the experts must know everything. (It is an assumption that I later reversed, then amended that to acknowledging that none of us really know anything). And so you look at the Tampa Bay Rays, and you try to figure out what's beyond the horizon. The Rays are not an easy prediction in most seasons. They have such a flux of players because of their plan of jettisoning most players who are making decent coin. They buy low. They sell high. They hope that a player (Avasail Garcia?) can heal on their dime, then be swapped for a nice return. Last year, I thought the Rays could lose 100 games. Really, I did. Instead, they won 90. I miss a lot of predictions, but usually, it isn't that bad. And this year? I think they'll be in the same area code as last. But I could be 10 games off. In which case, the Rays will make a monkey out of me. I bring all of this up because my favorite baseball internet site, baseballreference.com, has aligned itself with some absurdity called Marcel the Monkey's projections. Really. Now, you can decide for yourself whether to treat this as the scriptures or as the back page of the Weekly World News. One thing going for the predictions is that it doesn't seem to take itself too seriously. It says it uses "as little intelligence as possible." Tom Tango, the caretaker of the system says "I do not stand behind these forecasts." Presumably, he stands off to the side, as if he's in a batter's box. At any rate, if you follow the Rays, you might be interested to get a load of this. Reigning Cy Young winner Blake Snell, who was 21-5 with a 1.89 ERA, is evidently due for a rocky encore. He's projected to go 13-7 with a 2.98 ERA, which seems to hint of an injury. Charlie Morton, the free agent who signed a two-year, $30 million contract? He's due for a 13-6 record with a 3.75 ERA. If a player gets more than a million dollars a win, couldn't that be called disappointing? Ryan Yarbrough, the system says, won't win 16 this season. He'll win nine. And so it goes. The Rays will be led in saves by Jose Alvarado ... with four. Huh? Ji-Man Choi will lead the team in home runs ... with 12. Joey Wendle will lead in average ... but he'll hit only .278. Right about now, I know what you're thinking. You're thinking "where can I lay down a bet?" Sadly, nowhere. But by now, you have a good idea of where Pete Rose got his start. Shortstop Willy Adames will lose eight points off of his batting average to .278. Tommy Pham, who hit .343 as a Ray, is projected to slump to .270. Kevin Kiermaier, who hit .217, is projected to rebound to .244. Nothing was said about how many games he will play. The new guys? Austin Meadows is predicted to have a .271 average. So is Garcia. Yandy Diaz is at .268. Mike Zunino is projected to hit .225. Matt Duffy is expected to lose 20 points to 274. Tyler Glasnow is expected to 3-7. And Kevin Cash? He's supposed to win 89 games. Of course, like you and I, any system is going to struggle to predict how various Rays will do. The players just aren't here long enough. In Snell's two seasons before last. year, he won a total of 11 games. The system doesn't seem to allow for breakthrough years. Bottom line? It's just another dart thrown at another board, empty noise signifying nothing. You could do better with a pencil and a notebook. "Let's see. Blake will probably slide some, but not a lot. How about 17 wins?" There. That's less monkey-like than Marcel. The thing is, you can find a lot of preseason predictions out there. Most have the Rays around fourth place, it seems. Most expect good but not great. Most expect empty seats. As far as predictions, here are a couple from MLB.com. 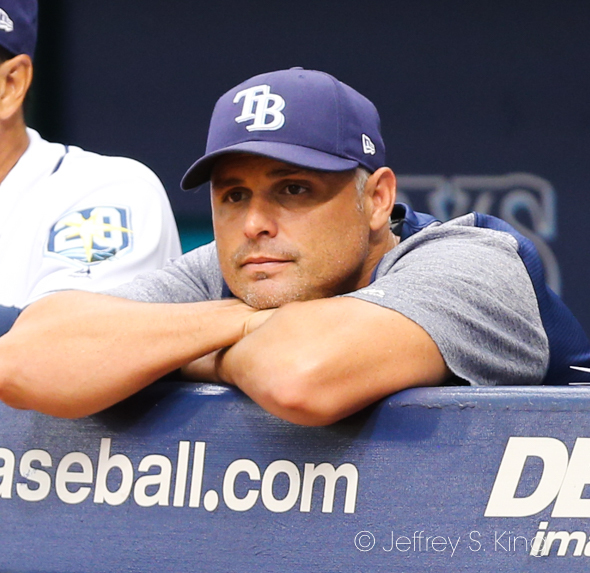 "The Rays will be the AL's top wild-card team. Not only will Yandy Diaz turn all that exit velocity into dingers, but Tampa Bay will have something that resembles an actual starting rotation. I cannot wait for Opening Day. Next post: Is this year’s Vasilevskiy better than last year’s?